Earthquake of 5.5 magnitude hit northeast India and parts of eastern Bangladesh at around 2:42 pm IST today. 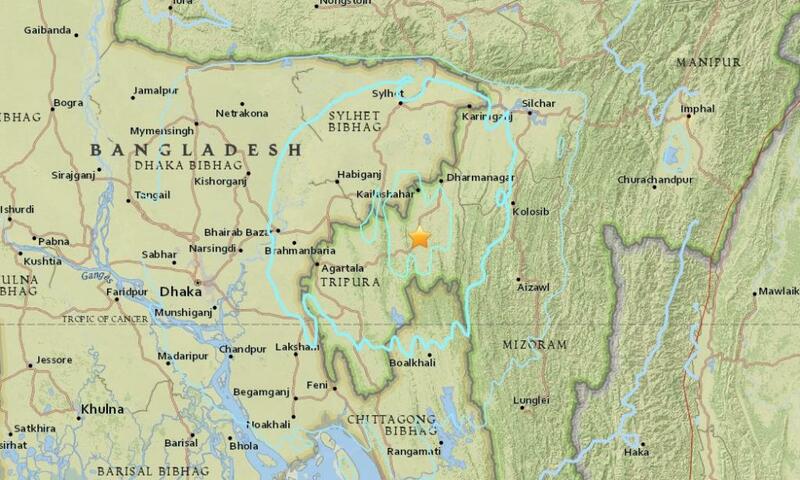 According to the United States Geological Survey (USGS), the epicenter of earthquake was 16 km from Kumarghat in Tripura. Mild tremors were felt in Guwahati . The tremors, which also jolted Bangladesh (Dhaka), were initially dim, followed by some strong ones. The tremors caused by a shallow earthquake lasted for about a minute. The earthquake had a depth of 36 kilometres. Tripura is highly vulnerable to earthquakes as it lies in seismic zone V.